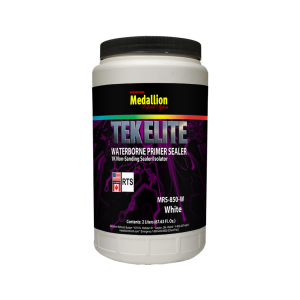 TEK ELITE Waterborne Primer Sealer is a premium non-sanding, ready-to-spray sealer that has superior solvent resistance for enhanced color holdout. It sprays out to a smooth, non-porous surface that creates a uniform surface for all topcoats, except lacquers. MRS-850 has excellent adhesion to a variety of bare metals and other automotive substrates. It can be used as an isolator over sensitive substrates and is V.O.C. compliant in North America. MRS-850B can be intermixed with MRS-850W to achieve various shades of grey. Packaged in a 2L container.